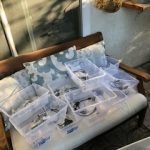 During the third weekend of January, Pete Heins-N6ZE and Woodie Woodward-WA6WDY spent 16 hours roving around SoCal to have fun…and that’s what they did! 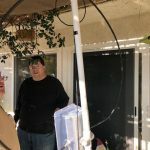 Pete Heins-N6ZE/R holds a 23cm (1294.5 MHz VJB Cheapie Yagi) and an ALINCO DJ-G7 triband FM handheld atop a ridge in the Santa Monica mountains (DM04qb) on Saturday of the January 2019 VHF Contest. 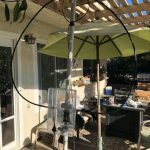 VHF/UHF propagation conditions to the San Diego area (Grid DM12) were what one would normally expect during summer months: 10 watt VHF/UHF stations with only whip antennae were easily worked. 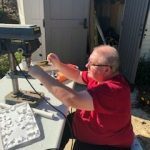 Best distance worked was with K6PFG (DM12mt) at 130 miles. The temperature inversion which produced the enhanced summer-like conditions is clearly in view behind N6ZE and just above the water surface of the Santa Monica Bay. 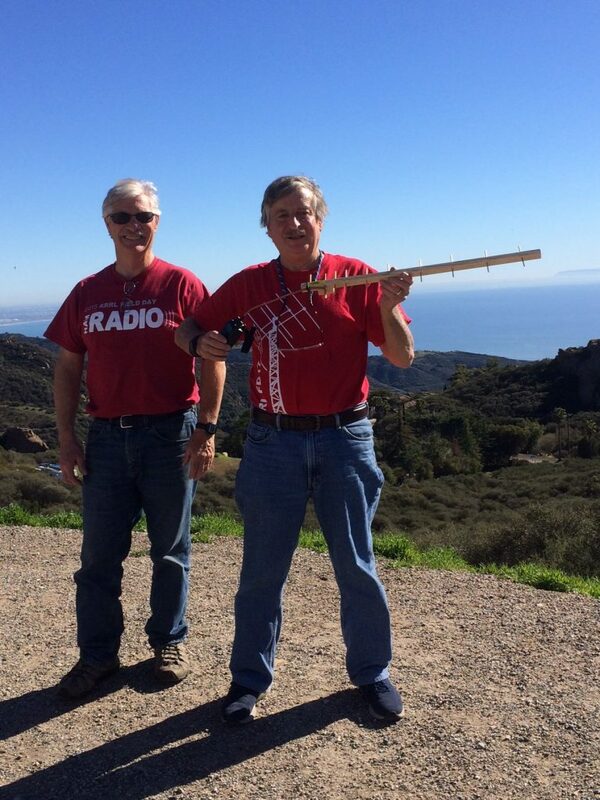 (Woodie Woodward-WA6WDY is wearing the “Radio” T-shirt. He frequently roves with Pete.) 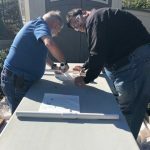 Note that two years ago, during January ‘17 VHF Contest, typical winter propagation conditions existed and no San Diego stations were heard. 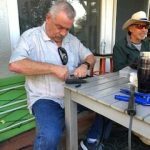 Pete and Woodie entered the ARRL’s January 2019 VHF Contest in the “Rover” category because they utilized six VHF/UHF bands: 6 meters on 50.125 MHz USB & 52.525 MHz FM; 2 meters on 144.200 MHz USB and various FM Simplex frequencies from 146.52 –> 146.61 MHz; 135 centimeters on 223.5 MHz FM; 70 centimeters on 432.1 MHz USB & 446.0 MHz FM; 33 centimeters on 927.5 MHz FM; and 23 centimeters on 1294.5 MHz FM. As N6ZE/Rover, the duo drove 150 miles in Ventura, southern Los Angeles and Orange counties on Saturday. The weather was supreme with summer-like temperatures in the 70s, great visibility and calm winds. A temperature inversion, typically observed during summer months, was noted visually and by VHF/UHF signal reports between Malibu (DM04) and San Diego (DM12). On Sunday, they drove 300 miles in Ventura, northern Los Angeles and Kern counties; temperatures were a bit lower than on Saturday with some winds in the high desert. 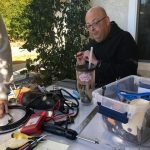 One of their “missions” for this contest was to encourage VHF/UHF operating by Ventura County amateur radio stations. In the weeks before the contest, N6ZE sent a number of e-mail announcements to Ventura County amateur radio clubs to advertise the event. 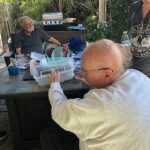 On Saturday morning, at the beginning of the contest, and Sunday evening, near the finish of the VHF contest, they made special efforts to work stations in and around Thousand Oaks, their home territory. Because VHF contesting does not use repeaters and some newer hams have had very little experience with simplex (i.e. comms without the use of a repeater), this provided a great training opportunity for newbies and helped their contest score as well! 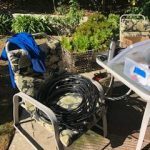 They worked about 15 Ventura county stations on one or more bands from 6 meters to 23 cm. N6ZE/R also used ALINCO handheld FM radios with modest 9 element yagis for 33 cm (927.5 MHz) and 23 cm (1294.5 MHz). They used only a yellow pad of paper for all logging. They did not bring a laptop so the N1MM logging program was not available nor did they utilize FT-8 data communications. 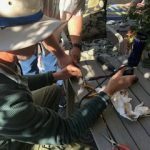 They used an FT-857 all-band multi-mode radio for 6 meters, 2 meters, and 70 cm. That radio has two antenna terminals: one for HF and 6 meters and another one for both 2 meters and 70 cm. 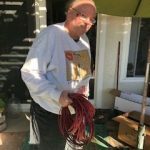 The ¼ wave 6 meter whip was connected at all times. A dual-band short whip was utilized for both 2 meters and 70 cm to eliminate antenna switching and to keep things simple. For 223.5 MHz FM, they used a Kenwood TM231 with ½ wave whip. Pete and Woodie intentionally kept things uncomplicated to minimize opportunities for error and failure. Interesting bits of trivia: N6ZE/R activated six grids including DM03, DM04, DM05, DM13, DM14 and DM15. 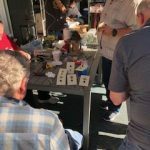 They operated from four ARRL Sections: Santa Barbara, Los Angeles, Orange and San Joaquin Valley in ARRL’s Southwestern Division. 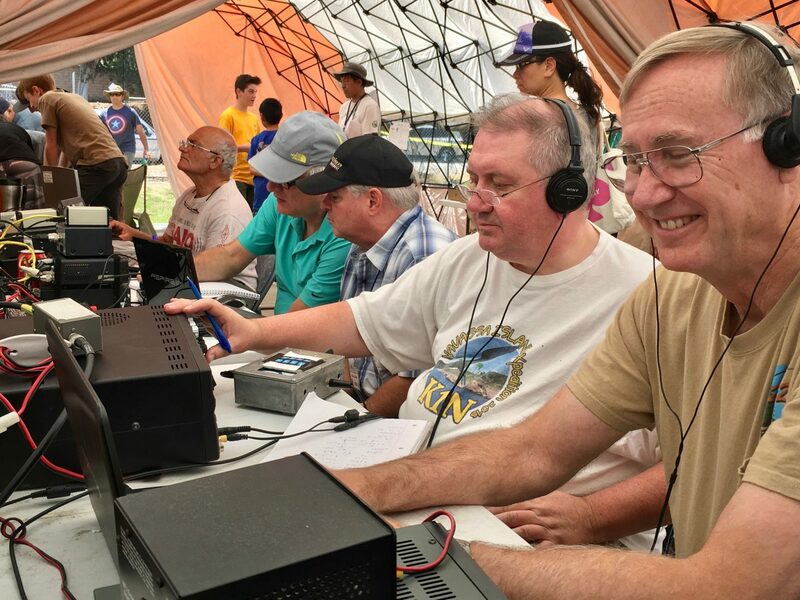 They established contact with N6VI on six different bands while operating in DM04qb. While roving in Ventura, Los Angeles and Orange Counties on Saturday, N6ZE/R made just over 70 QSOs while driving about 150 miles. Grids DM03, DM12 and DM13 were added to our totals on a variety of bands, including 70 cm. 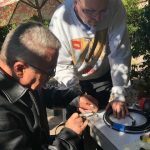 While roving in Canyon Country and the High Desert on Sunday, they made 25 QSOs while diving 300 miles. 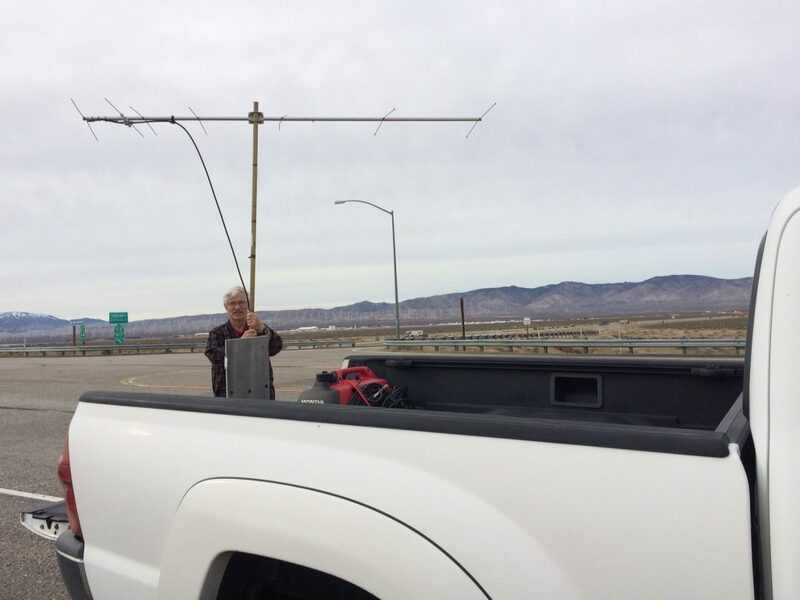 The longest distance contact with a Thousand Oaks station was with W6RH on 2m while N6ZE/R was traveling on North on CA 14 near the Grapevine. From DM15, they made contact with N6FD in DM15 on both 6 and 2 meters. 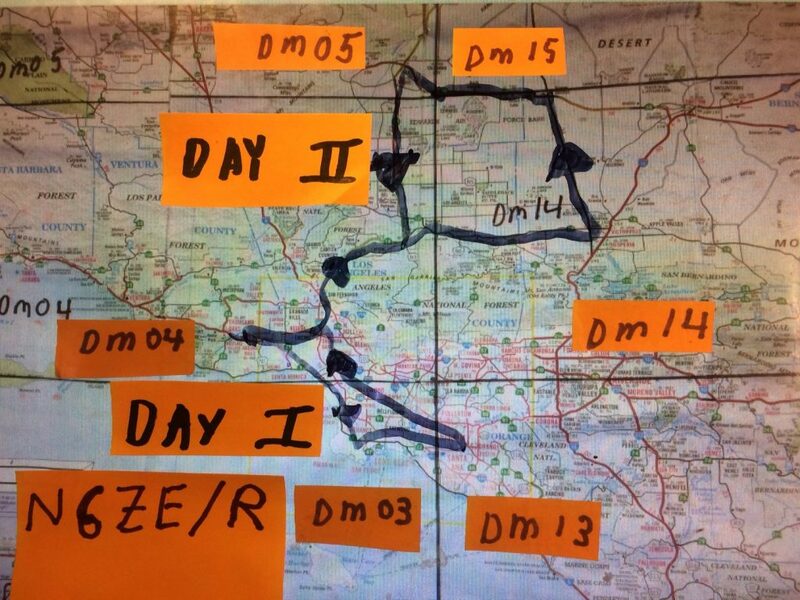 They never heard any stations located in DM05 while they were in Mojave, but N6ZE/R made a number of contacts with stations in DM03, DM04, DM13, & DM15 during the drive in the high desert. Closeup view of Woodie-WA6WDY and 7 element M Square 2 meter yagi in Mojave (DM05wc). Note in the background are windmills and the mothballed airline fleet at Mojave Airport. 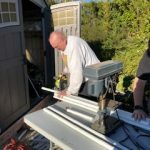 Because N6ZE/R made stops of very short duration and the desire to keep things as simple as possible, they never used the tripod/mast/rotor/yagi combo or fired up the multi-band Yaesu FT736 with an A.C. generator. Roving within the city limits of Thousand Oaks netted local contacts with stations located from Ventura to Simi Valley. 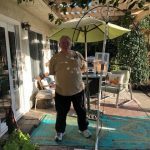 WA6EJO, Ventura (DM04jg) four bands, including 1294.5 MHz; N7WLC provided three bands, including 927.5 MHz; KK6UE, AB6ET, W6RH, AG6AG, W6NCT, AE6JR, W0UFC each provided three bands; and WI6O, K6KY, WA6RIE, KK6RBW, KM6MIN each provided one QSO. 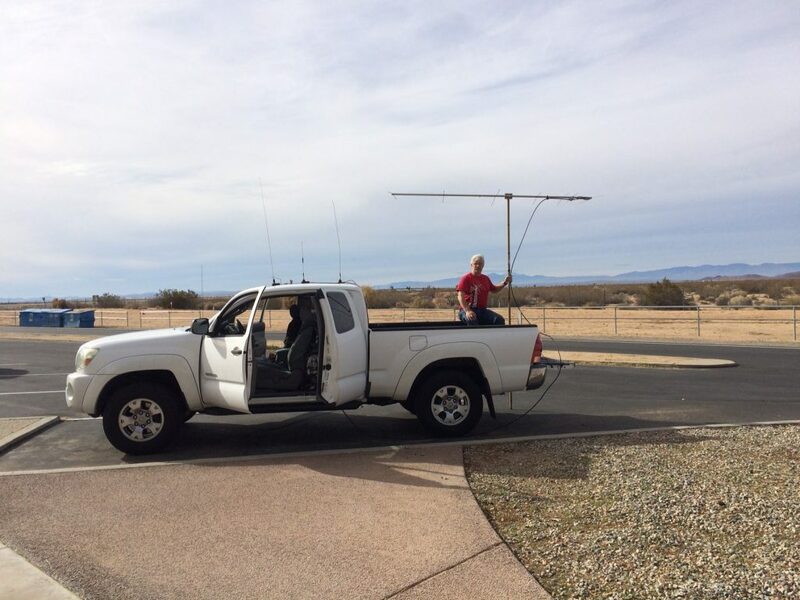 This was a nice demonstration of local VHF operating possibilities. Thanks to all for participating! To plan navigation to other grids, N6ZE uses a road map with grid locator boundary lines drawn in. It has a 2 or 3 mile accuracy to enable you to see what grid you are actually located in. The AAA Auto Club “California Map” has latitude and longitude markers so it is an easy exercise to draw in the grid boundary lines and label the grids as shown in this photo. A grid locator is 1 degree of latitude by 2 degrees of longitude. N6ZE/R’s Day 1 (150 miles) and Day 2 route (300 miles) are roughly drawn on the chart: grids DM04, DM03 and DM13 on Day I and grids DM04, DM14, DM15 and DM05 on Day 2. 2. A Garmin GPS that shows latitude and longitude, upon which the Grid Locator System is based. 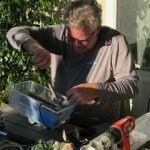 Note: At some point N6ZE plans to publish a primer of the DOs, DON’Ts, and MAYBEs for newbie VHF contesters developed from his years of VHF Contesting missteps and experience.